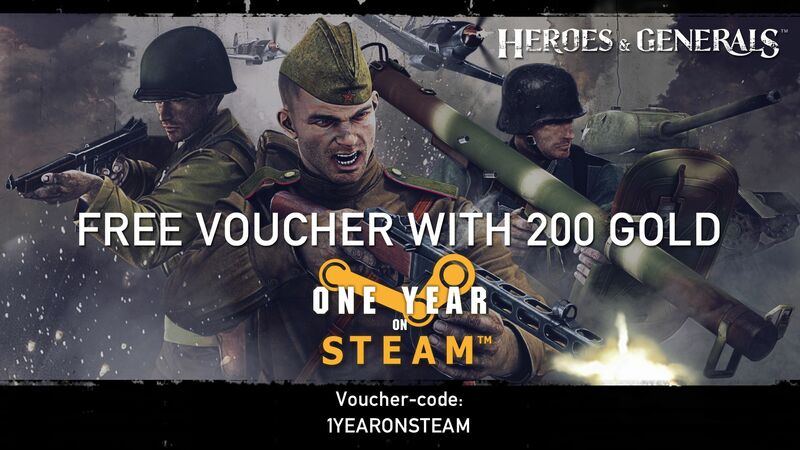 Happy Steam-iversary to Heroes & Generals, the free to play combat game by Reto-Moto. Today marks the 1 year mark since the game was released on Steam and quite a bit has changed since then. Launching on Steam helped Heroes & Generals reach the 5.5 million users mark and to celebrate, Reto-Moto is doing what it does best for events like these: passing out free gold. Head on over to the game’s official site or log into the client on Steam and redeem the below code to receive your free 200 gold. In the meantime, Reto-Moto has release a handy infographic to celebrate the occasion. Check it out and here’s to another year of stomping out more than 2200 bugs, please! 200 gold is hardly a gift as you can’t buy anything in the game with it. A pair of binoculars costs 400 gold ffs. Maybe things have changed – but I have always found that the player to map size ratio has been way off. Maybe I have been spoiled by other multiplayer shooters but it’s the same reason I left Planetside 2 – why spend 30 minutes running from point A to point B only to kill 1 person and get shot yourself when I can play CS GO or Day of Defeat for my shooter itch. This is a spam? If yes please block it.